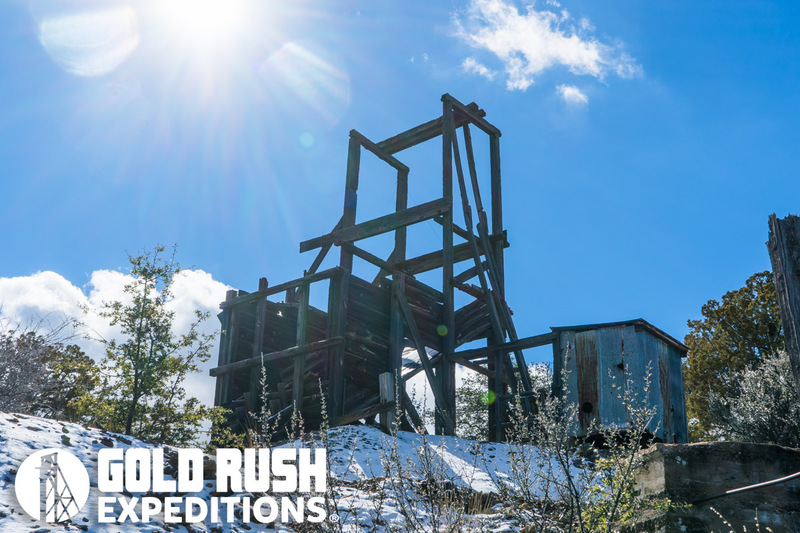 The Silver Dollar mine is a historic Gold and Silver mining claim that dates back to 1894-1895. The mines have been worked over the years on a small scale. The largest developments in 1900 when a double battery stamp and gravity mill was installed and again in 1939 when a leach type mill was established at the site. The Mine was again worked in the 1950’s and 1960’s and produced a “good living” for the owners (oral communications). There was never any production officially reported from the mine, which only indicates that the owners kept recoveries private. Its inconceivable to build mills and process on site if there is no recovery. The Silver Dollar Mine resides in the western Burro Mountains and is located in what is locally known as the “Golden Halo”. The Golden Halo is an area of mineralization emanating in a circular pattern from the massive Tyrone Copper Mine. The Tyrone, while a documented copper mine, is no slouch in the gold department boasting over 1,000,000 ounces of gold produced up to 1986. The Silver Dollar has limited history and its spotty at that. The mine is reached by an offshoot road that breaks from another small branch road. The mine is a reported 160’ in depth with various cross cut drifts. Based on waste dumps and remaining tailings, surveyors estimate there are roughly 1500’ of total workings. The mine resides in a general gold trend that has had pockets of gold developed with values of over 100 ounces/Ton in Gold. (Osmer, Foster). The mine has a secure gating system in place. A double compartment shaft that is in excellent condition. Ladders and rail system are in place and appear in good repair. A head frame stands above the shaft and is stable and usable with minimal stabilization. The road to the mine is in good condition with exception of an off camber, steep wash out that is 6’ deep and 5-6’ wide. A bridge will need to be built or some excavating required to drive vehicles to the mine site. This is common for the region and large storms will wreak havoc on desert roads and passages. The mine is a hidden gem just outside of Silver City, which affords all necessary implements for mining and also accommodations, food and other supplies. Located 26 miles outside of Silver City New Mexico. The majority of the roads to the mine are easy 4WD roads. The final stretch to mine entrances has one large washout that will need repaired to drive full size vehicles directly to the mines. The Silver Dollar is a valuable Gold and Silver Mining claim in the western Burro Mountains outside of Silver City. The property is a turn key Mining operation that is ready for work today. The mine shows gold and silver ores in waste dumps and lightly processed tailings, assumed only rudimentary crushing and chemical washing. Two distinct mills have existed on the site, one gravity mill with a single battery stamp, and later (likely 1950s) a leaching process operation. The property is or was, obviously well cared for and shows remnants of two small mills. One; an older, crush and separate operation, and more recently a chemical separation plant. Neither mill was built for processing silver in any form, but for gold, in both native and sulfide forms. There is record of gold and silver being mined, but no records of production. The mine is accessed via a large double compartment shaft that has been maintained or recently rehabilitated. The mine is secured by a metal grating system with cut outs for air and water lines There are existing cable systems which can be utilized by the existing head-frame with integrated ore bin. There is plumbing and likely a pump below that is powered by the new electrical lines and cabling that run into the mine. It appears that water has been pumped from the mine and dumped into the wash below the mine. A recently constructed (1980's) storage shed with an electrical breaker box, sits adjacent to the shaft. The air venting is in place but no fans or power were present. It appears that the storage shed once held pumps and fans and the shed is in excellent condition, but there are no fans or pumps at present. The claim includes the remnants of two milling operations. There is a mill directly underneath the mine that appears to have contained a crusher and separation vats. Another, later mill looks like it may have been a cyanide leaching operation. The presence of two mills on the claim indicate a large recovery and underground operation to justify the building of a full mill and processing center. The surveyors were not able to locate any high grade ores below the mill. The overall condition of the mine, which has been well maintained, and the existing infrastructure in the mine (that has been maintained) infer that there are likely substantial reserves underground. Local mining operations (Silver Dollar, Osmer, Foster) have reported extremely high valued gold ore pockets, with one report stating that 400 lbs were extracted, with a valuation of $80,000.00 per ton (1964 values). Surveyors assess the site was worked for gold and likely not silver as there is a lot of iron and quartz that has been crushed and discarded just below the ore bin. Would be ideal for a small group of miners from the initial returns of the mine. Contact Gold Rush Expeditions for a full GRMP-43 report that details the geology of the Silver Dollar mineral property. Contact Gold Rush Expeditions for a full GRMP-43 report that details the history of the Silver Dollar mineral property. High valued gold ore pockets have been reported in the local mining operations around the Silver Dollar. One report states 400 pounds of ore was extracted and valued at $80,000.00 per ton. Contact Jason at Gold Rush Expeditions with questions or for more information.